quality of life. Send us your story or comment on the blog. Ken Merritt of Landmark Engineering presented for the developer of the first phase of Namaqua Central. joined to 22nd Street which currently dead-ends inside Loveland city limits just before with Morning Drive. close county roads if necessary. 200 feet in the distance. He then showed pictures of his wife standing on Morning Driving less than 200 ft.
from their home where only the very tip of her head could be seen. or constructed for through traffic." development thus eliminating the need to connect 22nd Street onto Morning Drive for better circulation. 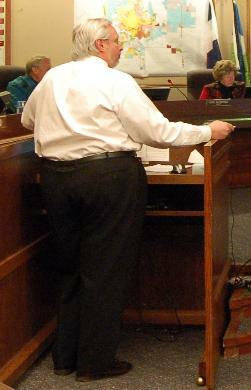 concerns raised in Mike Thompson's appeal. front the development as pedestrian will. 22nd Street) is the maintenance required to ensure emergency only through ways are kept open. not be able to converse with the residents. outside the hearing on the same matter. Please feel free to comment on our BLOG. see LovelandPolitics' original story from October 2008.